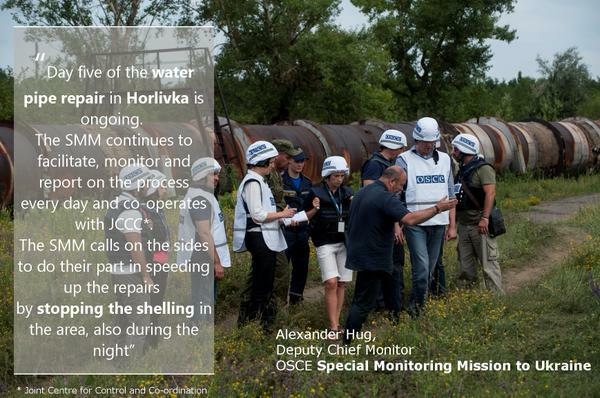 During yesterday’s (07.07.2015) session of the Trilateral OSCE – Ukraine -Russia Contact Group for the regulation of the situation in Donbas, in which representatives of the “DNR/LNR” [Donetsk and Luhansk People’s Republics, respectively] took part, the activity of the Russian-terrorist troops in Donbas somewhat decreased. But, after the conclusion of the session, the insurgents resumed active operations. Terrorists used 82-mm and 120-mm mortars, as well as 122-mm and 152-mm artillery and armored vehicles to create fire strikes on the advanced ATO forces’ positions and onto settlements. In the vicinity of Bohdanivka, insurgents attempted to mount an offensive on an ATO forces’ position using a reinforced platoon of personnel supported by 82-mm mortars and heavy machine guns. (As a result of retaliatory fire by advanced units of the Ukrainian troops, the enemy fell back to their initial lines.) In the vicinity of Luhanske, a clash took place between ATO units and a terrorist sabotage and reconnaissance group which tried to penetrate the tactical rear of the Ukrainian troops (their attempt failed when the ATO forces opened fire from small arms). Near Hranitne, several insurgent mobile groups opened fire from 82-mm mortars; automatic AGS-17 grenade launchers were used several times. The enemy employed 152-mm artillery in the same area (the artillery battery is stationed on positions near Michurine, north of Telmanove). In the area between Pavlopil and Chermalyk, a three-gun insurgent mortar battery (120-mm mortars) made several strikes. After the shelling, the firing unit promptly changed its position. Later, in the same area, terrorists deployed a tank unit (three tanks maneuvering in the first line; one of them made 5-6 precision fire strikes on the Ukrainian positions using high-capacity projectiles, while the other two tanks provided cover; one of the latter opened fire from a machine-gun). In the Donetsk direction [of attack], insurgents stationed west and northwest of the city carried out continuous small arms fire with sporadic use of AGS-17 grenade launchers and 82-mm mortars in the Mar’inka – Avdiivka stretch, and north of the settlement (Krasnohorivka, Opytne, Pisky). North of Avdiivka, in the vicinity of Novhorodske, the enemy also deployed 120-mm mortars and heavy infantry armaments, shelling one of the Ukrainian strongholds. In the Svitlodarsk bridgehead (areas of Luhanske, Myronivske, Lozove), several groups of terrorist “infantry” (each consisting of 15-20 personnel) attempted to approach the positions of the ATO forces in order to open fire from small arms. In all cases, the ATO forces opened retaliatory fire, forcing the enemy to fall back to their initial lines. In the vicinity of Zolote, Katerynivka and Orikhove, we also observed the attempts of small enemy infantry groups to enter the “no-man’s land” under cover of vegetation, in order to open close-range small arms fire and locate the firing positions of the ATO forces in the Hirske – Lysychansk areas. The IR group analysts believe that these areas (the Hirske – Popasna stretch) requires the particular attention of the ATO command, considering the fact that a large insurgent tactical group with armored combat vehicles and tanks is concentrated in the Pervomaisk – Kirovsk – Irmino area. In the area of Krymske, after a brief shelling from AGS-17 grenade launchers and ZU-23-2 guns, insurgent groups (approximately 50 personnel split into 3 groups) attempted to approach the ATO forces positions located between Sokilnyky and southeast of Krymske, moving from the direction of the Bakhmut Highway and using the folds in the terrain to their advantage. After Ukrainian units opened fire, the enemy retreated to their initial lines. Near Shchastya, insurgents shelled the facilities of the Luhansk Heat and Power Plant using 120-mm mortars. The insurgent mortar positions are located in the area of Vesela Hora. In the vicinity of Stanytsia Luhanska, insurgents are shelling the positions of the ATO forces using 82-mm mortars. 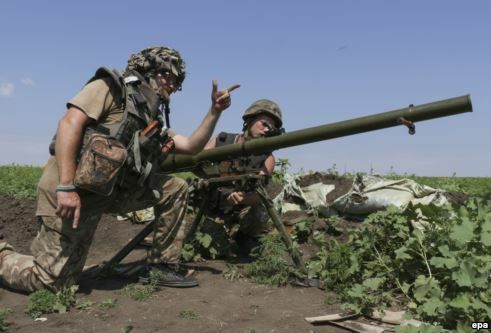 Operating under cover of mortar fire, insurgent groups made several attempts to approach the ATO forces positions and open fire from small arms. Aerial drones were spotted six times over the past 24 hours over different areas of the ATO area (one of them was shot down by ATO forces over the Azov Sea). In Donetsk, armored vehicles are being transferred to the northern part of the city (3-4 units in one go). Over the last 24 hours, we also observed a tank group and up to five armored combat vehicles (BMP-1 BMP-2) transferring through the Kyivskyi district, in the direction of the Donetsk Airport. The gangs of the “Horlivka Garrison” are being regrouped. Vehicles and combat equipment have been concentrated north of the Stirol plant (up to 15 trucks, some of them carrying insurgents, plus three BTR-80 armored personnel carriers, two armored reconnaissance vehicles, one BAT tracklayer, and two tanks). A new tactical group (up to a reinforced battalion in strength, 450-500 personnel) is being formed in the “Lutuhyne Camps.” Combat equipment is being supplied through Luhansk and Krasnyi Luch. The artillery group within this tactical group is essentially fully formed (five 122-mm Gvozdika 2S1 self-propelled guns, and three BM-21 Grad multiple rocket launcher systems). Six train cars carrying ammunition and gear for terrorists have arrived in Ilovaisk from the Russian Federation. The shipping service was provided by Russian Railways JSC. From time to time, insurgents are pulling combat equipment to Luhansk through Metalist for repairs and maintenance. The frequency of equipment malfunctions has increased sharply; the “LNR” command views this as “purposeful sabotage under the influence of Ukrainian propaganda,” done by terrorists of common rank. Several insurgents were arrested in connection with this. In Donetsk, the local “Ministry of State Security” has launched an active effort against “acts of civil disobedience” in the form of public displays of a pro-Ukrainian position by citizens (graffiti, public listening to Ukrainian music in the street and on board of transport, the production and distribution of home-made pro-Ukrainian leaflets, etc.). The “DNR Ministry of State Security” calls on local citizens to report such facts immediately. This entry was posted in Dmitry Tymchuk, English, English News, Pictures, South&Eastern Ukraine, War in Donbas and tagged #FreeKolchenko, #FreeKostenko, #FreeSavchenko, #freesentsov, #Information_Resistance, #RussiaInvadedUkraine, #StopRussianAggression, #UkraineUnderAttack, Dmitry Tymchuk, Donbas. Bookmark the permalink.